It’s something completely different than Timy, it’s a gimmicky fun app that can be used to browse through some of Raz*War‘s products. But if you want you can order the blades right from within the app. We also added some nice effects to the app: if you swipe over a blade you can get cut, and shaking the phone shows shaving foam. Nascom created this App for Raz*War. Raz*War is a brand offering quality shaving products at fair prices and you can check their website and all products atwww.razwar.com. 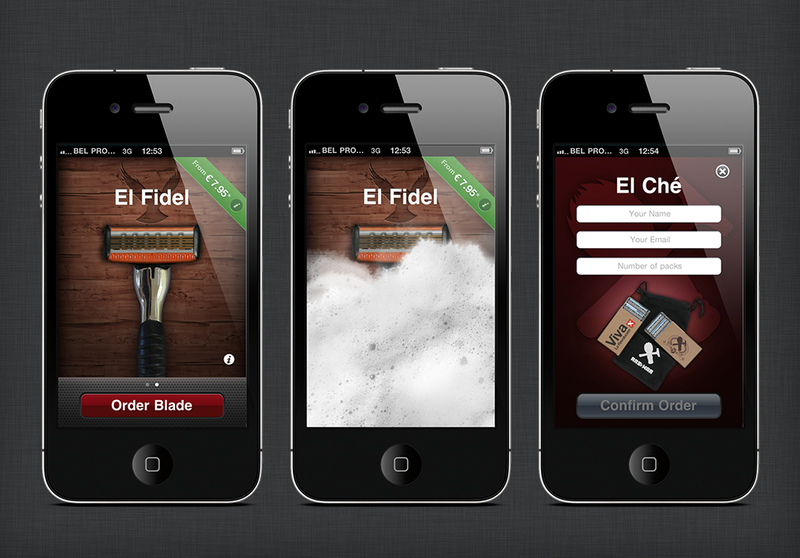 So I would advice you to visit their website and order a Starter Kit (El Che or El Fidel), so you can start using the app to order a blades refill. It was a small project, but it was very fun to do. For me the the graphics and animations were a fun challenge but easily done with Core Animation. The assets were made by some of my Designer colleagues. I also liked the Designer – Developer workflow in this project. All and all we did this is a very short time. It took less time to develop than Apple needed to approve it! DescriptionIt’s a gimmicky fun app that can be used to browse through some of Raz*War‘s products.